Wedmore in Somerset (sometimes known as The Isle of Wedmore – more on that a little later) is another beautiful village which is well worth exploring. It’s just a dozen miles from my B&B. 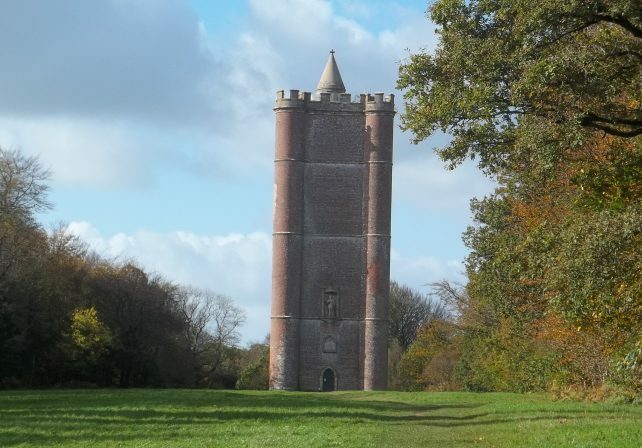 The name of Wedmore may ring a distant bell. If so, it’s probably to do with the village’s association with a major peace treaty or the annual award of an art ‘prize’. But before delving into that, let me explain the name. 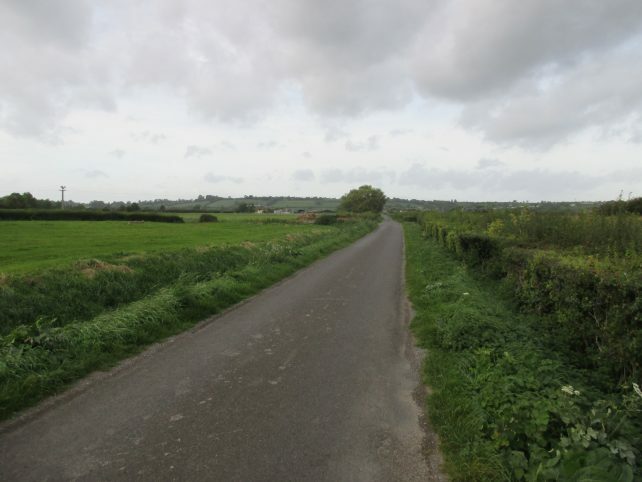 The Saxons came up with, ‘The Isle of Wedmore’. Back in their day – due to the vagaries of the rivers Brue and Axe – the surrounding area used to flood. Wedmore is hardly set on a lofty peak, but the 200 feet or so above sea level made a heck of a difference back then. When the flat moorlands flooded, Wedmore was left as an island. During the Anglo-Saxon period the Vikings used to regularly invade Britain. In those days, England had 4 kingdoms; East Anglia, Mercia, Northumbria and Wessex. It was only the latter which survived the marauding Vikings. And this is where that distant bell may start ringing. In 878, the Viking forces were defeated by Alfred the Great and the Treaty of Wedmore was signed. (Somerset Day on 11 May honours Alfred and the people of Somerset who marched with him. This verbal agreement between King Alfred and the defeated Viking leader King Guthrum acknowledged one another’s territories. As part of the deal King Guthrum agreed to be baptised. 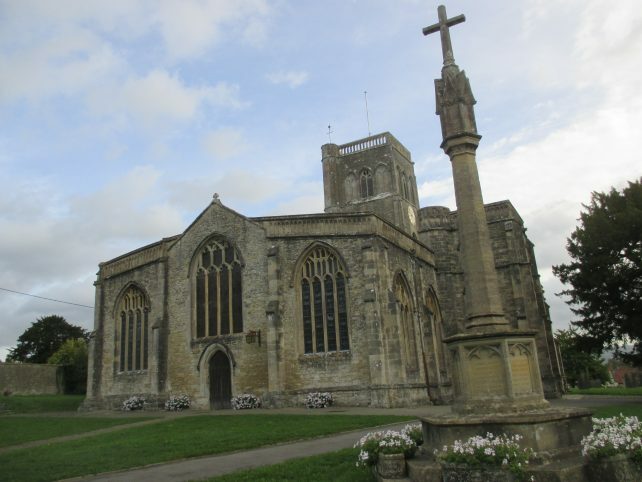 It is believed that following the service, Alfred and his now baptised Godson, “Aethelstan” enjoyed 12 days of entertainment at Alfred’s manor house in Wedmore. Under the terms of the agreement Aethelstan withdrew to East Anglia where he ruled as King for a decade. The period of peace which followed gave rise to the first truly united Kingdom of England. In the grounds of St. Mary’s church is a beautiful war memorial. 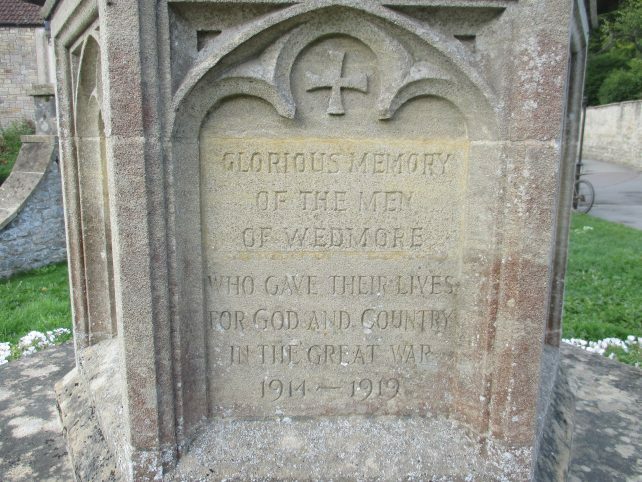 This Grade II listed monument honours those members of Wedmore parish who lost their lives in both the First and Second World Wars. The memorial was built in the 1920s and is made of local stone. 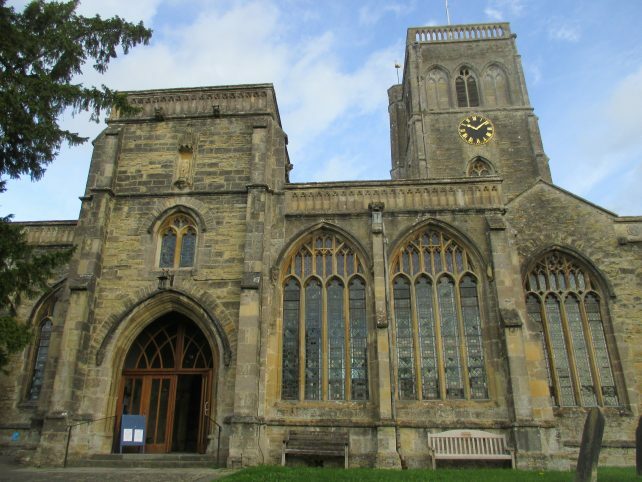 In the 1850s, 200 Saxon coins were discovered in the churchyard. More recently, a Saxon bronze ring was unearthed in Wedmore. Some historical artefacts found in the area date back to the Iron Age! Back in the mid 1850s the village had a population of just over 4,000. (Today it is around 3,300.) At that time, Wedmore hosted two annual summer fairs and a weekly market. Businesses included a brick-making works, a brewery, a tannery, blacksmiths, two wheelwrights, a clockmaker, saddlers, a shoemaker and a large emporium – the local ‘Harrods’ of its day. There were also two windmills, eight inns and a corn chandler! Today, there is an equally diverse range of shops and businesses to enjoy. Three pubs remain in the village and one of these, The New Inn, hosts the Turnip Prize (a spoof of the Turner Prize). The ‘competition’ sees fantastically ridiculous artwork exhibited in the pub. As the pub says it is a “chance to be judged the most feeble work of art in this internationally acclaimed fiasco.” Previous winners have included Bonksy for his work entitled ‘Dismal And’ (The Symbol ‘&’ Looking Dismal). Brilliant. Sticking with the unusual, Bioaqua farm in Blackford (The Isle of Wedmore includes over a dozen villages) is the largest aquaponic trout farm in Europe. They are passionate about mindful eating practices and their food tastes great. (The business has featured recently on TV.) They usually have a stall at the Frome market and also attend many of Somerset’s great festivals. Talking of festivals, Wedmore has a few of its very own. Among them are the Wedmore Arts Festival. This festival is now well established and attracts some great names while the Wedmore Real Ale Festival may, if you get too carried away, make you forget your own… At the Real Ale Festival there are over 80 different brews to sample. In its 18 years, the festival has raised over £160,000 for local causes. If cider is more your thing (and Somerset is the spiritual home of the stuff) then a visit to Roger Wilkins’ Cider Farm is a must. His Lands End Farm is high on my recommended list of, ‘Places to go in Somerset‘. In December, enjoy Wedmore by Lamplight. This Christmas event is all about fun, food & shopping. It usually takes place in the evening during the second week of December. It’s on the 12th December in 2018. If you’ve got kids in tow then they can let off steam at the Recreation Ground. Fancy a round which doesn’t involve drinks? Then visit the friendly Isle of Wedmore Golf Club. 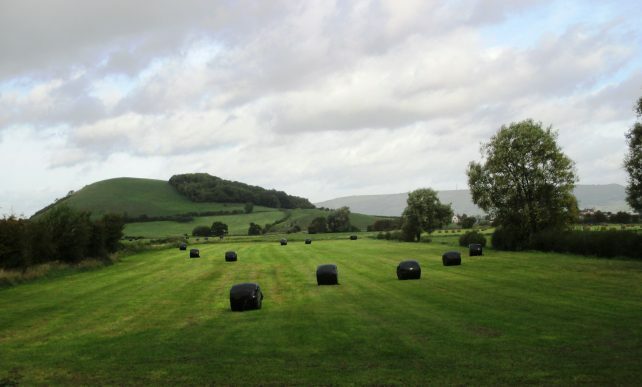 Or keep it simple and just enjoy the stunning countryside which surrounds Wedmore. Remember when ‘twinning’ towns and villages with European counterparts was all the rage? Well, Wedmore is ‘twinned’ with the small town of Saint Médard de Guizières in the south west of France. In 1995, the two swapped gifts to commemorate the twentieth anniversary of the twinning association. Wedmore received a grape press and, in return, donated a red phone box which still stands in the main square at St. Médard. More recently, some of the villagers in Wedmore have been raising money in an effort to ‘twin’ their public loos! The charity, Toilet Twinning is a water and sanitation initiative which provides clean water, access to safe toilets and hygiene education in some of the world’s poorest countries. (Apparently, over 2 billion people don’t have somewhere safe to go to the toilet.) Wedmore’s parish council have got behind the initiative as well, so if you use one of the public conveniences in Wedmore you should see a certificate on the wall promoting the charity and explaining how the donation of £60 to twin a toilet works. 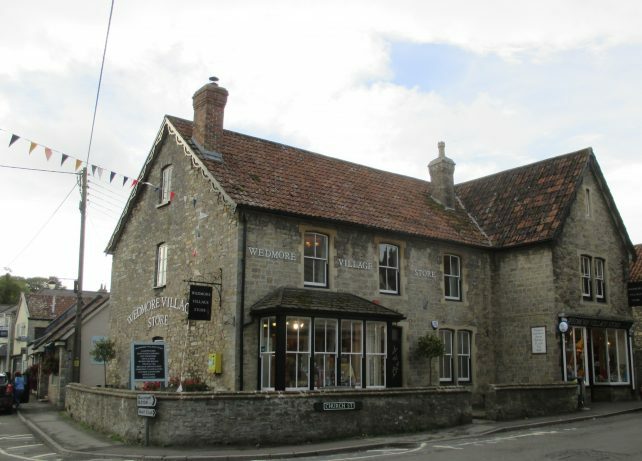 Wedmore – a village where even the toilets have a story to tell!